Chinese New Year is just around the corner, and according to Feng Shui principles, now is the time to get your home in order for 2015. During this time of renewal, we can think of no better way to start a new year than to clear the clutter and create a more holistic space. If you’re feeling completely clueless about how Feng Shui works, we’ve got good news for you! Thanks to our good friend, architect and Feng Shui practitioner Anjie Cho, you can learn how to Feng Shui your home the easy way—we’re giving away a signed copy of Anjie’s newly released book, 108 Ways to Create Holistic Spaces, to 9 lucky winners, and one very special grand prize winner will receive a signed copy of the book in addition to a $108 gift certificate to Anjie’s Holistic Spaces Online Store, a 2015 Feng Shui Charm Keychain for Protection & Luck, and a Natural Crystal Bagua Set. Find out how to win this lucky prize pack below! 1. SIGN UP FOR THE INHABITAT NEWSLETTER HERE > We’ll be announcing the winners in our weekly newsletter, so if you want to find out who won, you’ll need to receive it! 2. LEAVE A COMMENT BELOW telling us why you’re interested in Feng Shui and how you feel it might improve your living space. The deadline for this giveaway is Monday, February 23rd at 11:59PM. We’ll pick the comments we like best and announce the winners in our February 26th newsletter, so make sure you’re signed up! Feng Shui can be life-changing, but it can also seem overwhelming at the very beginning. In 108 Ways to Create Holistic Spaces, Anjie provides easy to understand tips for implementing Feng Shui and green design principles into any indoor space. Her simple, straightforward tips will help you transform your home or your workplace, from discovering where to place your furniture to understanding the power of color. This book is a great resource to help you improve the flow of energy throughout your life. 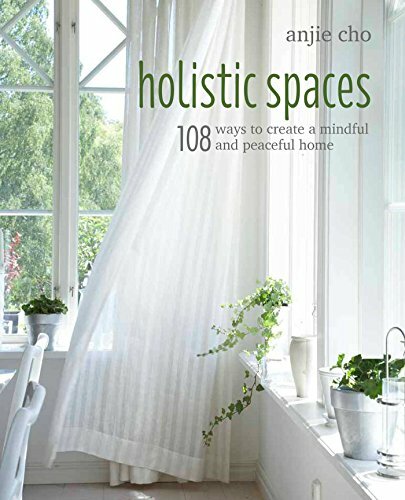 10 winners will be selected to win author-signed copies of 108 Ways to Create Holistic Spaces! 2015 welcomes in the Year of the Ram, otherwise known as the sheep or goat. According to Feng Shui tradition, the horse is the ram’s best friend, so it is especially auspicious to carry around a three-dimensional horse with you, as it is said to bring protection and good luck. For those of us who don’t have real-life horses in our lives, this beautifully handmade keychain will do just fine! Made with an eco-friendly hemp cord using Feng Shui dimensions, it’ll grant symbolic protection and good luck to its owner all year long. The Feng Shui bagua map is used in the BTB tradition of Feng Shui and divides the different areas of our personal lives across nine quadrants of our homes. This set of nine tumbled semi-precious gemstones correspond to each Feng Shui bagua area, symbolizing well-being in nine different areas of our lives, including health, relationships, knowledge, and abundance. Our grand prize winner will receive this exquisite gift set from the Holistic Spaces Store, featuring a stunning assortment of natural gemstones including amethyst, tiger’s eye, and rose quartz. Tell us why you’d like to win this essential DIY Feng Shui prize pack in the comments below!